Dr. Koushik Basu is working in ASG Eye Hospital as Refractive, Cataract (Phaco technique), Corneal transplant & Glaucoma Surgery specialist. 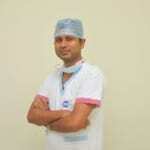 Dr. Koushik Basu is having vast experience of doing Cataract (Phaco technique) and Trab surgeries. I have to work on system for 6 to 8 hrs and my glasses number is 8 and 8.5 and even age of 23 my number don't got stable hence I m worried and I could not gone through lasic and appy lasic due to thin corniea is there any other way to get rid from glasses than contact lenses please let me know thank you. It can be due to progressive myopia, also one should rule out keratoconus. If it becomes stable, you can undergo icl (lens implantation in the eye) even if cornea is thin. Kindly consult ophthalmologist. I have red eyes from last 15 Days. What should I do? Can you give me some suggestions? Eyes appear red because the vessels at the surface of the white portion of the eye (sclera) become swollen. Vessels may swell due to: •	Eye dryness •	Too much sun exposure •	Dust or other particles in the eye •	Allergies •	Infection •	Injury Homoeopathic medicine EUPHRASIA 30 ( Dr Reckeweg) Drink 2 drops direct on tongue every 2-3 hrly EUPHRASIA EYEDROPS ( SBL ) pour into eyes 1-2 drops 3 times daily If no relief within 2 days,please cosult an Eye specialist for physical examination. Sir actually when I study for morw than 3 hours continuously. My eyes get weaken. So is this serious or usual. Nothing to worry aabout,it is just normal .just keep ssure that there is proper lightening in your study room.It is just due to overstraining of eyes. Sir I have vision problem and I want to know about the laser treatment and what is the procedure for that and what will be the cost of the treatment and one more thing common problem is hair losses I have lot of dandruff how to clean dandruff permenately so please help me out. My left eye blinks continuously from the past 3days I would like to have a solution for this if possible. Usually subsides on its own, if persistant then better get your vision tested at an eye care clinic. I am a ca student. I study for 10 hrs/day. At the end of the day I feel my vision is dimming down. I m 22. I am a male. My eyes blinks a lot and itching continues for a long period of time. You must be blinking frequently because of allergy and probable tear deficiency. An antihistamine eye drop along with tear substitute might help. Hello sir I have a eye problem my eye become weak since sixth clas what should I do now for get rid of from this problem please suggest me for this situation. Weak eye sight is commonly due to spectacle power. You just need to get it checked in an eye clinic. I'm suffering from severe headache and through that I'm unable to see the things properly so kindly give me some suggestions to recover. Hi take pranacharya no tens capsule 1_1 twice a day. 1-1 drop of cow ghee in both nostrils at night time before sleep. Take shirshooladi vajra ras twice a day with honey. Avoid tea and coffee.